The major fire in Central City on May 21, 1874 nearly wiped out the commercial district of the city. The new building was completed by November 1st of the same year and B.F. Pease operated a dry goods store at the location for nearly 10 years. For a time there was a undertaking parlor situated on the property, but the longest residing business was the office of the Observer Publishing Co. which published the Gilpin County Observer newspaper. 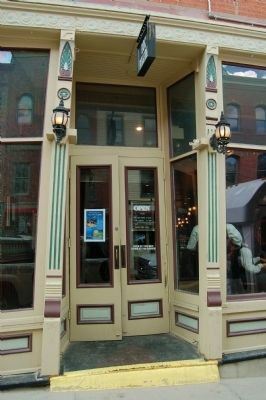 At the turn of century, Ignatz Meyer came into possession of the building and in 1901 he added a second story and had the main floor modernized. 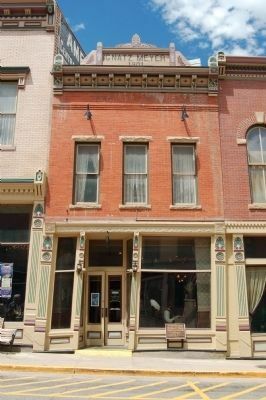 Ignatz’s saloon became one of the principle businesses in the city until prohibition forced a change in the nature of the business, which became that of a pool hall. After being sold at tax sales twice in the 1930’s, Henry Toll purchased the building in 1940. In 1948 the property returned to business of selling alcohol when it became Emmy Wilson’s famous and infamous, Glory Hole Tavern. 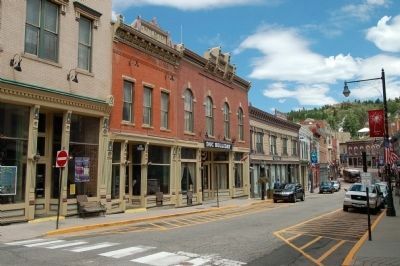 Central City, Colorado, in Gilpin County. Marker is on Main Street. Touch for map. Marker is at or near this postal address: 131 Main Street, Central City CO 80427, United States of America. Touch for directions. Other nearby markers. At least 8 other markers are within one mile of this marker, measured as the crow flies. The AOUW Building (a few steps from this marker); The Rose Haydee Building (a few steps from this marker); Central City Opera (within shouting distance of this marker); Central City (within shouting distance of this marker); Washington Hall (about 500 feet away, measured in a direct line); Train Trestle (approx. one mile away); Bird’s-eye view of Black Hawk (approx. one mile away); Fick’s Carriage Shop (approx. one mile away). Touch for a list and map of all markers in Central City. More about this marker. The AOUW Building (left), the Ignatz Meyer Building (center) and the Rose Haydee Building (right), a modern construction, have been ‘renovated’ and combined into the Doc Holliday Casino. Now part of the Doc Holliday Casino. More. 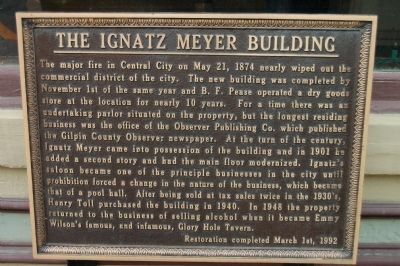 Search the internet for The Ignatz Meyer Building. Credits. This page was last revised on June 16, 2016. This page originally submitted on January 21, 2012, by Barry Swackhamer of San Jose, California. This page has been viewed 597 times since then and 10 times this year. Photos: 1, 2, 3, 4. submitted on January 21, 2012, by Barry Swackhamer of San Jose, California. • Syd Whittle was the editor who published this page.